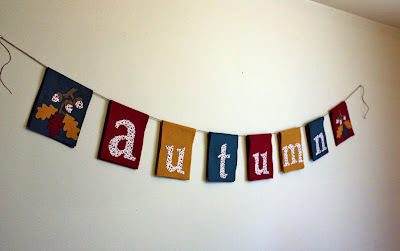 I completed my felt Autumn banner and hung it in our dining room area! I am so pleased with how it turned out! It looks fantastic! This banner was inspired by Amanda Blake Soule's new book, Handmade Home. Amanda is also the author of The Creative Family: How to Encourage Imagination and Nurture Family Connections! I created this no-sew version of her One-Word Banner that is featured on the cover of Handmade Home! Check out some other wonderful crafts inspired by SouleMama on Flickr. Olivia, that banner is so perfect! The colors and the design. Beautiful! I agree with Julia, I really like the no sew part! 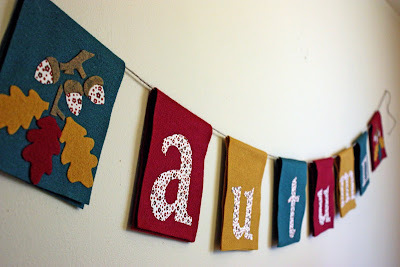 Different colors, different words, the possibilities are endless for this lovely banner. I plan to check out the book you mentioned, Homemade Home, by Amanda Blake Soule. It looks fantastic! I love the colours that you chose. I am just about to go to my sewing class and I have that exact book in my bag. I will be making a few of the projects from both her books. I love what you have made for your little wee ones to enjoy.